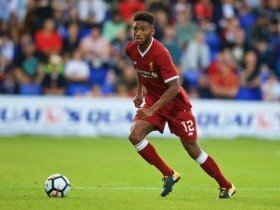 Liverpool have confirmed another setback for Joe Gomez, who has undergone a surgery to recover from the leg fracture sustained against Burnley in December. The England international was initially expected to return to action during the backend of January but he happened to suffer a complication during the rehabilitation process. Owing to this, he has now undergone an operation to rectify the issue and the same has been confirmed by the Reds through their official website on Monday. Aside from Gomez, Dejan Lovren and Trent Alexander-Arnold are the other defenders on the sidelines, although the latter is expected to return by the end of the month. Jurgen Klopp has confirmed that the right-back will return to first-team training next week, although the Champions League round of 16 first leg game against Bayern Munich could come too soon for him. Liverpool recently dropped points for the second successive league game and they are now holding a slender three-point gap over Manchester City at the top of the table.